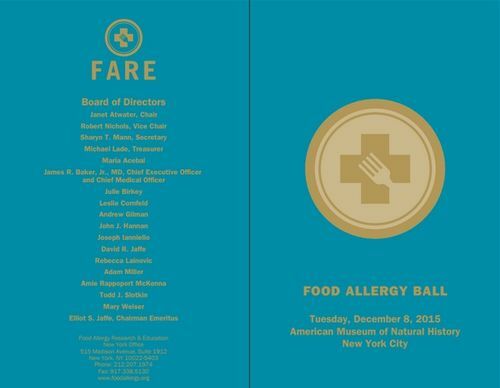 18th Annual FARE Ball (Food Allergy Research & Education) Dec. 8th, American Museum of Natural History, all proceeds to benefit FARE the nation's largest advocacy on behalf of 15 million Americans with food allergy. his commitment to FARE’s mission. for their commitment to excellence and compassion for diners with food allergies. contributions in improving accommodations for airline passengers will food allergies. Tables are available for $50,000, $25,000 and $15,000, and individual tickets are available for $5,000, $2,500 and $1,000. For ticket information or purchase visit: For more information, please visit www.foodallergy.org. For press information, please contact Mitchell Manning Associates at 212-980-1711 or info@mitchellmanning.com.